Background: Plasmonic light trapping in thin-film crystalline silicon solar cells is numerically investigated using finite-difference time-domain simulations. Method: Enhancement of optical absorption due to the excitation of localized surface plasmons in a periodic arrangement of aluminum nanostructures is analyzed. Result: Broadband photocurrent enhancement in a 1 µm thick silicon film can be observed over the 500-800 nm spectral range of interest. Conclusion: Photocurrent density under Air Mass 1.5 global solar irradiation has been found to be enhanced by up to 40% using aluminum nanostructures with 300 nm width and 100 nm thick. The present work offers a cost-effective plasmonic material for solar cell applications. 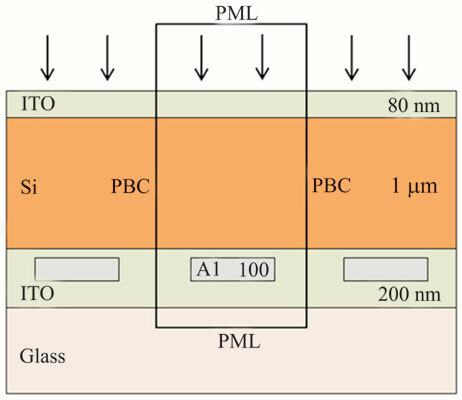 Thin-film solar cells, Light trapping, Surface plasmon, Optical absorption, Photocurrent density, Aluminum nanostructure.